Born February 13, 1949 in Vrsac, Yugoslavia (now Serbia). Married to Zagorka Lozanov-Crvenkovic, two children: Nikola (1984) and Marko (1990). Dositeja Obradovica 4, 21000 Novi Sad, Serbia. Office Phone: +381 21 485 28 59. Home Address: Fruskogorska 49 (apartment 34), 21000 Novi Sad, Serbia. Home Phone: +381 21 450 922. Mobile Phone: +381 63 80 07 246. B.Sc. in Mathematics: University of Novi Sad, 1972. M.Sc. in Mathematics: University of Belgrade, 1979. Thesis: Some Classes of Completely Regular Semigroups. Ph.D. in Mathematics: University of Novi Sad, May 21, 1981. Thesis: On Some Classes of Semigroups. 1974-1981: Teaching and Research Assistant, Institute of Mathematics, Faculty of Science, University of Novi Sad. 1981-1984: Assistant Professor, Institute of Mathematics, Faculty of Science, University of Novi Sad. 1984-1985: Adjunct Associate Professor, Department of Mathematical Sciences, University of Arkansas, Fayetteville, Arkansas, U.S.A.
1986-1992: Associate Professor, Institute of Mathematics, Faculty of Science, University of Novi Sad. 1992-: Full Professor, Institute/Department of Mathematics (and Informatics), Faculty of Science, University of Novi Sad. 1999-: Full Professor, Faculty of Science, Unversity of Banja Luka, Republic of Srpska, Bosnia and Herzegovina. Fall 2000: Visiting Professor, Department of Mathematics and Statistics, University of New Brunswick, Canada. Fall 2001: Visiting Professor (an LMS fellow), Department of Pure Mathematics, University of St Andrews, Scotland, UK. 1981-1995: President of the Committee for Mathematical High School Competitions in Vojvodina. 1988-1989: President of the Teaching and Scientific Board of the Faculty of Science, University of Novi Sad. 1990-1992: Head of Algebra, Institute of Mathematics, Faculty of Science, University of Novi Sad. 1992-1995: Member of the Federal Committee for Mathematical High School Competitions in Yugoslavia. 1995-2001: Member of the Committee for Mathematical High School Competitions in Serbia. 1996-2002: Head of Algebra and Discrete Mathematics, Institute of Mathematics, Faculty of Science, University of Novi Sad. 2003-: Member of the Center for Permanent Teacher Education, Faculty of Science, University of Banja Luka, Republic of Srpska, Bosnia and Herzegovina. 2004-: Head of General Algebra and Theoretical Computer Science, Department of Mathematics and Informatics, Faculty of Science, University of Novi Sad. Currently: Analysis of Algorithms, Formal Languages and Automata. Previously: Theory of Algorithms, Methodology of Mathematical Education, Linear Algebra, General Algebra, Mathematical Logic and Set Theory. Universal Algebra, Semigroup Theory, Algorithmic Problems in Algebra, Theory of Automata and Formal Languages, Philosophy and History of Mathematics. Ph.D. students: Rozalia Madarasz, Igor Dolinka, Milovan Vincic. M.Sc. students: Rozalia Madarasz, Jelena Cvetkovic, Nikola Ruskuc*, Dejan Delic, Igor Dolinka, Milovan Vincic, Branislav Prastalo, Stevan Pujic**, Biljana Sukara-Celic**. 10 invited lectures at international conferences. about 20 invited lectures at mathematical seminars at the following universities and institutions: Jozsef Attila University Szeged, University of Nis, University of Skopje, Mathematical Institute of the Hungarian Academy of Sciences, Mathematical Institute of the Serbian Academy of Sciences and Arts, University of Arkansas, University of New Brunswick, University of St Andrews, University of Banja Luka. about 30 talks at international conferences in Austria, Czechoslovakia, Germany, Hungary, Poland, U.S.A., Russia and Yugoslavia. 1989-: Member of the AMS and a referee for the Mathematical Reviews. 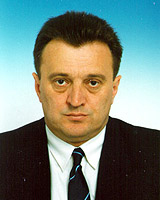 1993-2001: Head of the Board of Trustees of Serbian Mathematical Society. IREX Postdoctoral Fellowship in the Mathematical Sciences, 1984-1985. 1986: Member of the Editorial Board of the Proceedings of the 5th Conference “Algebra & Logic” (Cetinje, 1985). 1989: Editor of the Proceedings of the 6th Conference “Algebra & Logic” (Sarajevo, 1987). 1999: Co-editor of the Proceedings of the 8th Conference “Algebra & Logic” (Novi Sad, 1998). 1997-2000: Supervisor at the Regional Center for the Gifted Children, Novi Sad. 2003-: Member of the Editorial Board of the Bulletin of Society of Mathematicians of Banja Luka. 2007: Editor of the Proceedings of the II Novi Sad Algebraic Conference – NSAC 2005 (Novi Sad, 2005).